The Stewart family home on Front Street, with duct tape holding together chain link fencing at the entrance to the driveway, was in need of some repair work. 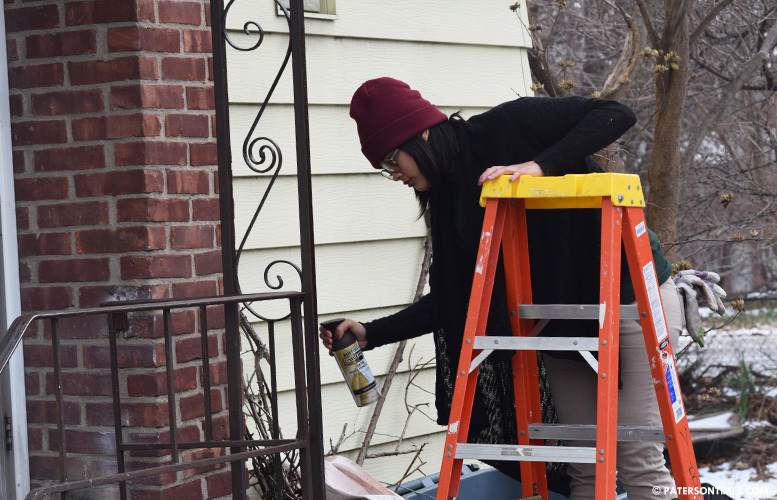 On Wednesday, half-dozen young people were busy taking out and installing two new fences to the driveway entrance and handling other repairs at the home — the first repair job in the FreePair Paterson program. One of those young people was Angelique Morales, 17, who was spraying rust off to the rusting railing in preparation for a paint job at the back entrance to the home while others opened up a can of paint to apply a fresh coat of green to the stairs and side of the portico. “We’re going to paint the railing. We’re going to paint the bottom. And we’re going to fix the awning there,” said Morales (pictured) pointing to a run-down old awning that hung above the back porch. Amy Stewart, who is caring for her wheelchair-confined mother, Mary Stewart, 96, said she was grateful to see the young people out here assisting the family with home repairs. She was surprised to see the group, working under strict supervision of a construction supervisor, brought two new pieces of fencing to replace the badly damaged ones held together with duct tape. “My mother is grateful. I’m grateful. It’s a wonderful group of kids.” said Stewart. “They are really helping out tremendously to improve the neighborhood and they are helping us.” Her father, who passed away 14 years ago, was the man in charge of handling repairs to the home. His passing left her to manage the repair work. The FreePair Paterson is a new program under the umbrella of the New Jersey Community Development Corporation (NJCDC) aimed at assisting elderly and disabled homeowners in maintaining their homes. The program launched on Wednesday employs young people enrolled in NJCDC’s YouthBuild, a second chance program for those who dropped out of high school. The new program is funded through a $100,000 grant from the Impact 100 Garden State. Over the next 12 months, the program will complete 500 repairs throughout the Silk City for elderly and disabled residents. Stewart said her mother, who owns the property, would probably not be able to pay for the repairs being completed by the young people. The monetary value of the repairs made through the program exceeds $1,000, according to construction officials supervising at the site. “Through this program, we’re committed to improving the homes of the people who live in this neighborhood by helping them fix everything from a broken door to even changing a lightbulb,” said Bob Guarasci, chief executive officer for the New Jersey Community Development Corporation. The launch of the program comes just days before the start of the holidays. Stewart said the repair work at her mother’s home was a wonderful Christmas present. She said her mother won’t see the new improvements made to the home until spring. Guarasci said the program also helps close a generation divide between the young and old. “It gave me faith back in the younger generation. I’m serious, I’m not just saying that. You see so many kids that throw garbage on the sidewalk and they don’t care,” said Stewart, 60, who learned about the upcoming home repair program when she saw a group of young people cleaning up her neighborhood during the summer and curiously approached them. “I’ve never seen anybody cleaning in Paterson. You’re worrying people,” she remarked recollecting her conversation with the group in the summer. Morales said it’s fulfilling to know she is helping an elderly person while working to secure practical experience for her resume. “Not only am I trying to work on myself, but also improving my surroundings and helping the people around me,” said Morales, who dropped out of John F. Kennedy High School’s School of Architecture and Construction Trades. She is hoping to obtain her high school equivalency certificate and enroll into the Passaic County Community College for a career in human services. The YouthBuild program takes 75 students every year and offers them a second chance through a mix of book learning to obtain their high school equivalency certificate and hands on training to secure construction trade certificates. 20 young people from the YouthBuild will cycle through the FreePair program. Jaloan Brown, 20, who dropped out of Eastside High School, has learned plumbing, electrical, and construction. He said he learned to build wall sockets from scratch in the program. He said he enjoys the hands on nature of the YouthBuild program. “I learned to use tools that I didn’t even know existed,” he said. Brown said the YouthBuild program has given him the tools to build his life. One day he hope to own his own plumbing or carpentry business so that he can build houses. For more information about the new program or to request free home repair for an elderly or disabled homeowner contact NJCDC at info@njcdc.org.